No sooner did I finish writing “Green Travel Trends for 2015” than my husband and I took off and traveled for a few days in June. That may seem odd, given that we live in the “paradise” of Tampa, Florida. You know – endless sunshine, white sandy beaches, palm trees. Portland has none of that. But we had heard good things about Portland’s commitment to being a “green city“, so we decided to check it out. Lots of trees and parks. There’s no “concrete canyon” feel here. Portland has managed to keep a LOT of trees and parks in the heart of the city. Portland has lots of trees in the city. Great public transit. It’s easy to get around. The transit system – which includes the MAX light rail plus street cars and buses – is clean, cheap and frequent. It’s also growing, with a new line opening in September. When your house has a walk score of 0, being able to walk out the door for a block and (1) stop at a coffee shop or (2) hop on public transit is a miracle. Signs of eco-consciousness everywhere. From the many bike riders (who can easily bring their bikes onto public transit), to the solar trash compacters on every block, to the ubiquitous recycling bins, it’s easy to be green in Portland. That’s all anecdotal, of course, but the statistics and rankings back up my impression. The Clean Edge guys are my “go-to” researchers for all things happening in “clean tech.” Earlier this month, they released their annual Clean Tech Leadership Index, rating all 50 states and the 50 largest metro areas on their “clean tech” activities. Craft Beer – There’s a “craft beer festival” in July, and more breweries than you can shake a stick at. Coffee – I visited the biggest Starbucks I have ever seen, and also sipped coffee at Peet’s and Stumptown. There are dozens of other independent coffee houses. Restaurants – Thai, Chinese, Morrocan, French, seafood, pizza, and “new American” were just some of the choices. Books – Public libraries and Powell’s books make this a book lover’s haven. 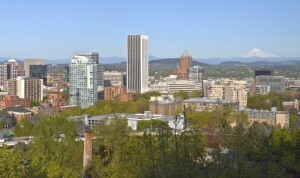 Education – Portland State is minutes from the center of town. Parks – There are over 10,000 acres of parks in the city. We spent time in Washington Park, which is 400 acres with 15 miles of trails. International Rose Test Garden – you really can “stop and smell the roses” at this 4.5 acre park. Waterfront – Portland sits on the Willamette River, and the variety of bridges crossing over to Washington state was astounding. Silicon Forest – which houses everything from IBM and HP to Microsoft and Intel. It’s an impressive concentration of tech companies employing upwards of 60,000 people. Portland green businesses – which tend to be smaller, but are impactful in their own ways. From organic restaurants to environmental consulting firms to engineers and architects, these organizations help bring that “eco-friendly” feel to the city every day. Keep up the good, green work, Portland! Gallup research shows that companies with more engaged employees are more profitable. Building a Culture for Sustainability profiles 9 companies. Companies often struggle with the “how.” How do you build a culture for sustainability in your particular company? 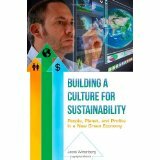 Jeana Wirtenberg’s new book, “Building a Culture for Sustainability,” helps answer that question. She spent 2 years profiling 9 companies in depth about their sustainability programs and practices. These are not “the usual suspects” like Whole Foods or Patagonia. These companies are big guys who have been around, in some cases, for over 100 years. They want to become more sustainable, but have a lot of history and baggage to deal with. The list below captures just 1 program or practice from each company. It doesn’t do justice to the full book, but it may persuade you to take a peek. If your business is in one of the industries covered, read that chapter. Better yet, pick a company in an industry different from yours. It’s an easy way to get a fresh perspective for your own sustainability journey. Alcatel Lucent is a telecom company built on the proud history of Bell Labs. They embrace a “triple bottom line” approach to business. To reach their sustainability goals, they organized “Green Touch” – a consortium of telecom companies whose goal is to make the global network “1000 times more energy-efficient by 2015.” To do that, companies share data that used to be proprietary. Cross-company collaboration is essential to get us where we need to go, and it’s a big culture change for many. Alcoa mines and manufactures aluminum – the “infinitely recyclable metal.” Alcoa has a “measurement culture.” Their A3 process – “assess, aspire, act” – is used to measure all kinds programs, not just sustainability ones. As Laurie Roy, HR director said, ” If you’re not measuring it, how do you know you are making progress?” Setting science-based goals, and measuring progress towards them is a key element of a sustainable culture. BASF is a company that believes “chemistry is what enables the transition to a sustainable society.” For example, they developed Green Sense concrete mixtures, which save water, energy and CO2 emissions compared to conventional concrete. This material is used, among other places, in the Freedom Tower in New York City. Sustainability is integral to their business – not bolted on to the side. Bureau Veritas is a world leader in testing, inspection and certification in over 140 countries. Their work with clients inspires them to reduce their own environmental footprint through energy, water and energy conservation programs. In addition, safety is ” not a priority, but an absolute.” That means 100% of employees receive ongoing training and communication about safety issues. From working safely at heights to safe driving, the focus is on prevention. Church & Dwight owns Arm & Hammer (the baking soda people) and a variety of other brands. They’ve been using 100% recycled board in their baking soda boxes for more than 100 years. They also offer full ingredient disclosure on many of their consumer products – a kind of transparency that truly sustainable companies will embrace. Ingersoll Rand has been in business for over 140 years. It’s a family of brands including Schlage and Trane. They’ve had great success building a sustainable culture using Green Teams. The number of teams doubled from 25 in 2010 to 52 in 2011 and doubled again to 110 in 2012. Each team focuses on improving their own facility’s environmental performance and on educating colleagues on “triple bottom line” issues. Locations with Green Teams have higher employee engagement scores than locations without Green Teams. ‘Nuf said. Pfizer is a global health care company. Their Global Health Fellows program places employees in 3 to 6 month stints abroad. This donation of people-expertise to countries with little to no health infrastructure builds trust in international communities. The Fellows get first-hand knowledge of areas where Pfizer can tweak its business model to better serve local people. And Pfizer builds employee engagement by offering this very popular program, where numbers of applicants far outstrip the number of slots. Sanofi is another health care giant. When you “put the patient first,” it’s a short step to seeing how sustainability supports that goal. Sanofi estimates that “13 million deaths can be prevented each year by safeguarding our environment.” Their CSR Ambassador Program enables employees from any department to volunteer for this role. Ambassadors learn about sustainability from in-house experts, and share that knowledge with colleagues. At Sanofi, this peer-to-peer approach is taking off. Wyndham Worldwide – This global hospitality company has a program called “Caught Green Handed.” It’s a recognition program that started in one business unit and spread to all the rest. Employees receive a certificate with their name and a description of their green contribution. This kind of program energizes employees and helps get the word out to others. There are many ways to build a culture of sustainability. If you want your business to perform well into the future, sustainability is your path to superior results. Building a sustainable culture is not about annual events and lip service. It’s about tapping into the power of all your people to re-imagine the core of your business in sustainable ways. That’s an exciting mission for people at all levels. So if your company is struggling with the “how,” grab a copy of Ms. Wirtenberg’s book. It offers detailed examples of what companies are doing. It is also frank about the challenges they’ve faced. These companies don’t have some secret sauce that makes the transition to green easy. But you can learn from the road they’ve already traveled, and build a sustainable culture that suits your organization. • I do more writing for clients than editing. • Clients and prospects were confused by the name, thinking I only do editing. • Folks who’ve been in the business longer than I have were unanimous in advising that the name “Great Green Content” better reflects my services. Enough said! I changed the name of my site. I see it as a natural evolution. • I still edit. If you are, or want to be, an editing client, I’m happy to serve. I have an attention to detail that scares some people, but when you are about to hit “send” or “publish” then you want someone like that. • I also write for businesses and organizations. I have for profit and nonprofit clients. See my Services page for all the details. • I especially target businesses and organizations that are transitioning to “greener” or more sustainable practices. 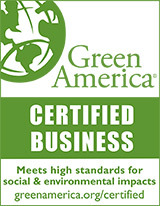 As a certified green business myself, I bring my own subject matter expertise to my clients, where I can. • You’ll find a renamed Facebook page here: https://www.facebook.com/greatgreencontent . Please “Like” the page if you haven’t already. • If you are on Great Green Editing’s newsletter mailing list, you are automatically subscribed to the Great Green Content newsletter. Its name is changing too. No action required on your part. • It’s still me – at your service. • A broader set of services to choose from – in addition to writing and editing, I can consult on your content marketing plans. • An online writer affiliated with Copyblogger. Creating content in today’s ever-changing landscape is a challenge. The experts at Copyblogger keep me tuned in to those changes. So welcome to Great Green Content! What can I do for you? Contact me at 813-968-1292 or at my business email address: Alison@greatgreencontent.com. And leave your comments below. What do you think of the changes?